One of the questions I’ve been trying to answer is when did women start sleeping in pajamas. This is important to me because it was pajamas-wearing that led to women wearing pants as a beach cover-up, which led to women wearing pants other than bathing suits, knickers or breeches in public. It’s not like women were not already wearing “pants” of some sort before the twentieth century. Drawers and pantaloons as underwear had been around for a long time. And while bloomers did not really catch on when Ms. Amelia advocated for them in the 1850s, nor when the practicality of them for riding bicycles came up in the 1890s, thousands of schoolgirls were wearing bloomers in gym class from the 1860s onward. Women who loved hiking had taken to wearing knickers and divided skirts. 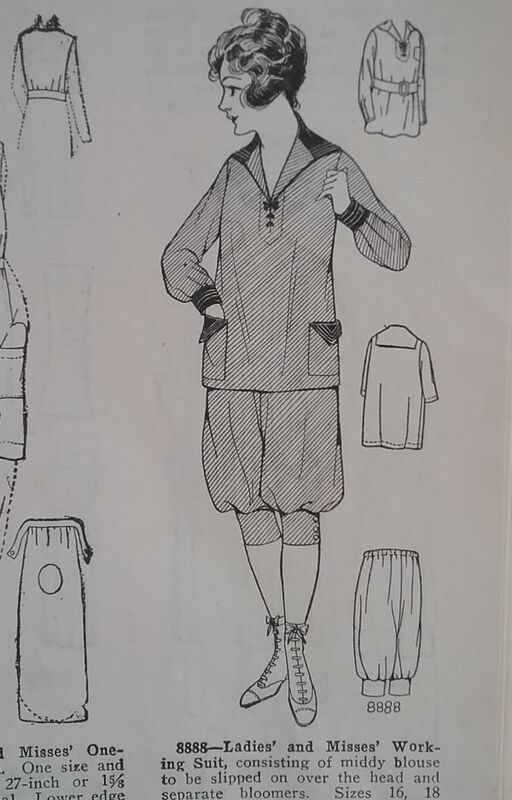 It seems a bit surprising to me that in all my resources, I can’t find an example of women in pajamas before the year 1912. I feel pretty sure that this is not the beginning of the practice, but I’ll be the first to admit that my resource library is a bit thin in the pre-1920s years. 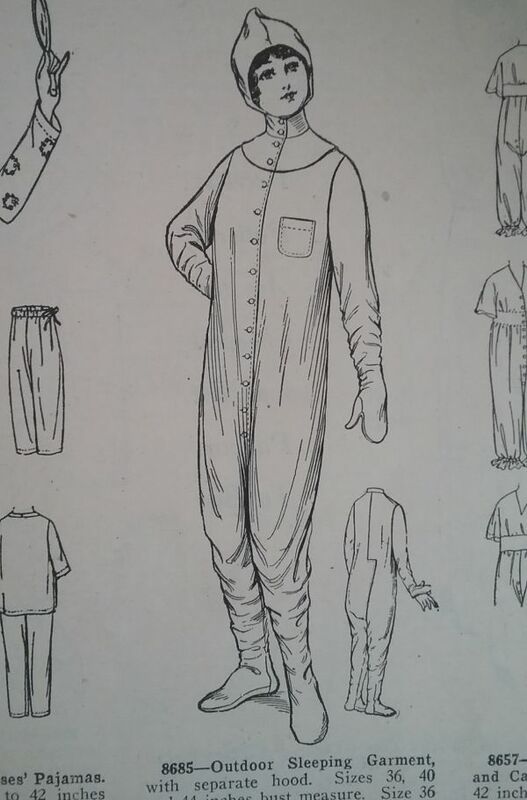 According to the 1912 Spring and Summer catalog from the Greenhut-Siegel Cooper Company, “Pajamas [are] the latest idea in underwear. Pajamas are growing more popular with women every year…For traveling, pajamas are convenient…” Even so, it appears that the nightgown continued to be the sleeping garment of choice for most women. It wasn’t until 1918 that I’ve found pajamas offered in a variety of styles in mass market and sewing pattern catalogs. 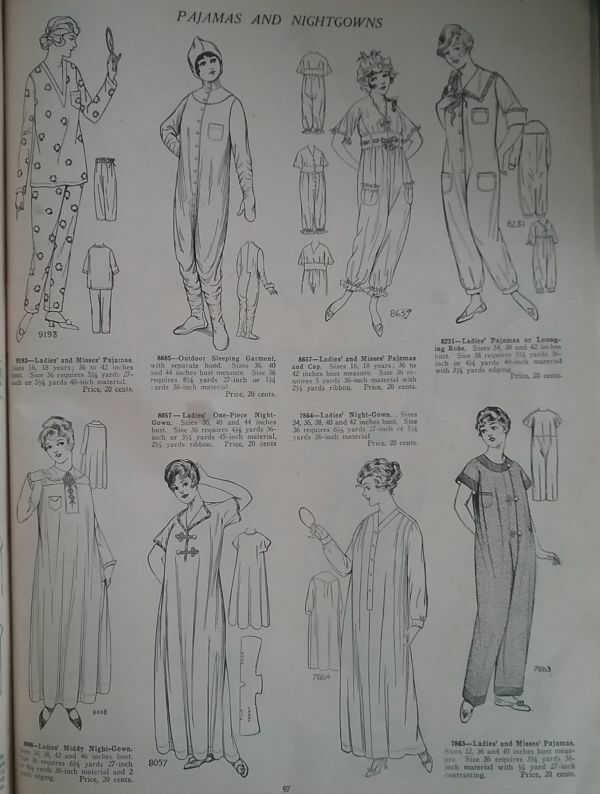 Starting in 1917 or so, pajamas became more prevalent in the catalogs I looked at, and a new, similar garment appeared – the work overall. 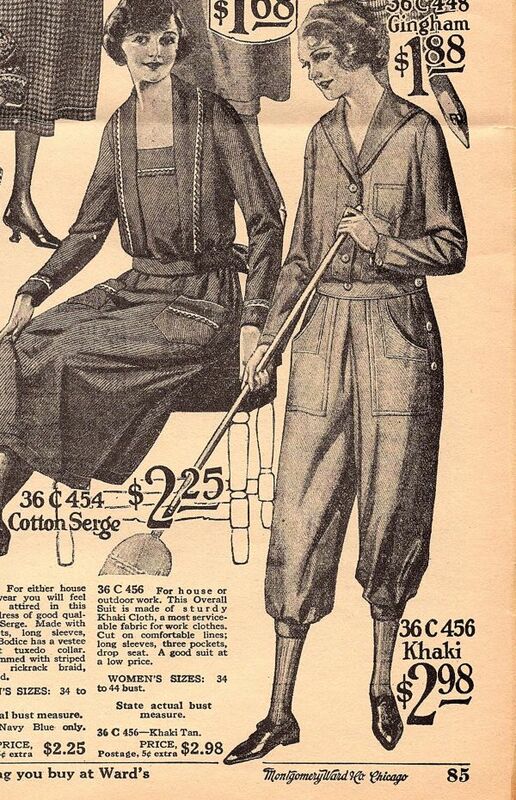 During World War I the necessity of women taking on jobs that were traditionally thought to be for men led to women adapting a male garment, the overall work pants. I can’t help but think that the increased popularity of pajamas for sleeping is related to the adoption of overalls for working. I do have a few things to say about this odd garment. It would keep a camper warm on chilly nights, but bless her heart if she had to answer the call of nature while wearing this suit. I keep fantasizing that the odd way the back seam zig-zags means that it is open below that horizontal seam. That would be most helpful. Lastly, the text describes the pants above as “bloomers” but they are actually an odd combination of bloomers and knickers. Bloomers usually have an elastic waist, very full legs, and elastic at the bottoms of the legs. Knickers usually button at the waist, have less full legs, and have a band that buttons at the bottoms of the legs. Blickers? While my main focus is sportswear, I sometimes have to take a slight detour to see other forces that were at work in the journey toward women wearing pants. One such detour is the influence of World War One. Many articles about women wearing pants will bring up WWII as being a watershed moment in the movement toward females in pants, and that is a true depiction. But we also need to remember the woman workers of WWI, as it was they who were truly the pioneers. I’ve written a lot about how bloomer gym suits and knickers on the hiking trails helped ease women into pants. But we need to remember that these were mainly women with money. What about the working class woman who had little time for leisure pursuits and no money for college? It’s likely that the first pants experience of most working class women was with a bathing suit, but it was during WWI that so many women took over jobs traditionally done by men. It made sense to adopt the working attire of men as well. The young workers above are wearing overall suits, and you can tell they have seen some very hard days. But note the shoes on the woman on the right. It looks as if she has pressed into service an old pair of dress shoes. One had to make do with what was available. WWI ended in 1918, but work overalls continued to be offered to women. 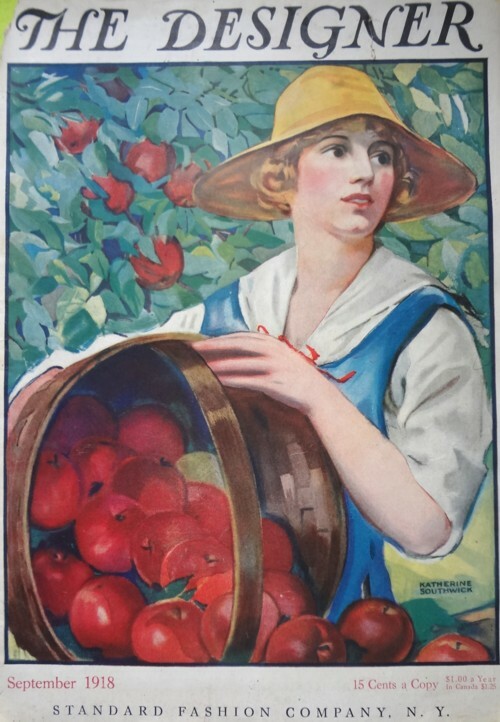 The illustration above is from a 1921 Montgomery Ward catalog. I have seen ads for sewing patterns for similar garments into the 1920s. 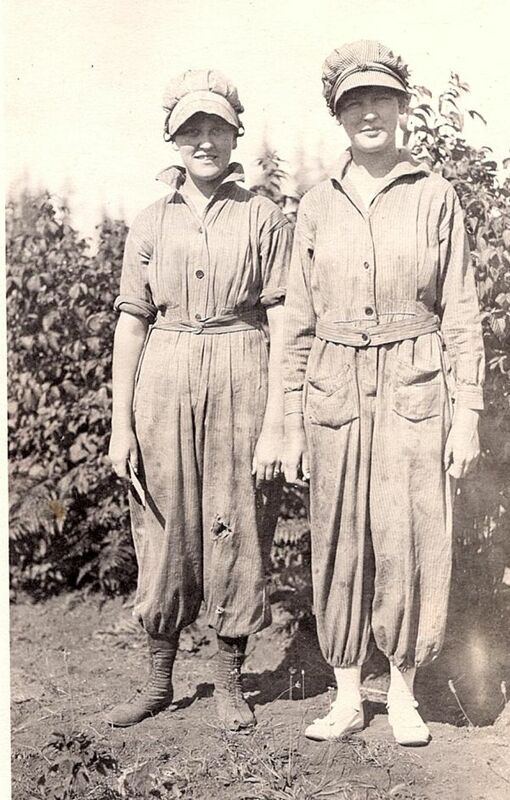 The wearing of overalls for work during WWI and the years immediately afterward did not directly lead to women taking up trousers for regular wear. It was, however, one of the many steps that allowed women to see the practicality of pants, and which got people used to the idea of women wearing pants. This is a card advertising a calendar for 1919. It’s most likely that WWI was still going when the card was distributed to the customers of Swift & Company. 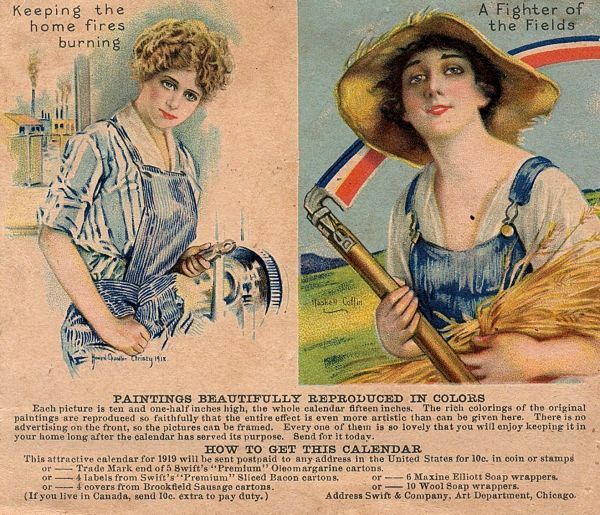 Women working – and wearing pants while working – was depicted as the patriotic thing for women to do. In writing about my photo I got to thinking about how history is taught. So often we look at WWI as a time period from 1914 to 1918, with battles from trenches, and poison gas, and No Man’s Land, and then the Armistice on 11/11/18. If individual people are considered at all, it is usually in anecdotes of Christmas Day cease fires or stories of heroic officers leading charges across barbed wire. Looked at it this way, the history of clothing takes on a significance that is often overlooked. 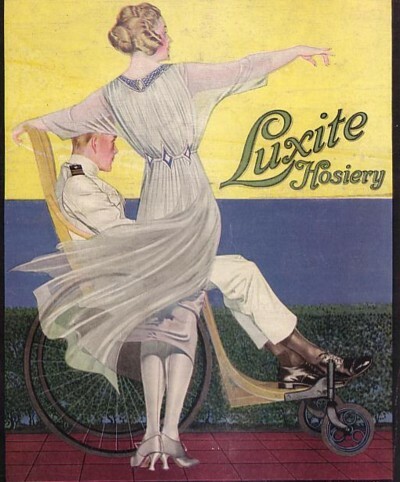 As this September, 1918 The Designer magazine was going to press, World War I was winding down in Europe. The Allies had begun the Hundred Days Offensive, and the Germans were looking for a way out without total surrender. At home, though, women continued to harvest the crops and to do other important jobs that were left vacant as male workers joined the armed forces. Many women wore pants, in the form of farm overalls or certain uniforms, for the very first time. I’m presently reading an advance copy of a book about the clothing of WWI, Dressed for War: Uniform, Civilian Clothing & Trappings, 1914 to 1918, written by Nina Edwards. Much of the information in the book is about dress in Britain, though Ms. Edwards includes information about clothing in Germany and the US and in the other participating countries. It’s about so much more than clothing, and it paints a vivid picture of the hardships both at home and in the trenches. WWI is now 100 years in the past, and that is a very long time. People who can actually remember the conflict are pretty much gone, and as for my own experience, the shared memories of my father and his contemporaries of WWII (which had ended only ten years before I was born) greatly overshadowed any tales I might have heard from a WWI soldier. My grandfather and great uncles were of that magic age where they were too young for WWI, but too old for WWII. So while WWII seems so real to a Baby Boomer like me, WWI seems so very long ago. It is important to read books like Dressed for War, because the author drew heavily from the diaries and written records of people who experienced life during that horrible conflict. We need to remember that wars are not just dates to memorize in history class. It is from the stories of history that we can truly learn. Dressed for War: Uniform, Civilian Clothing & Trappings, 1914 to 1918 is being published by I. B. Tauris, and is now available for pre-order on Amazon. Release date is December 31, 2014. This ad is from 1919, a year in which Americans were seeing the return of many injured servicemen from WWI. America had a bit of a romanticized view of the war, being so far removed from the horrors that Europe was experiencing, and even after the war ended, and many men came home with their rose-colored glasses removed, the public was pretty much unaware of the horrendous experience of it all. This ad came form a 1919 Harper’s Bazar. Many of the stories in the magazine, and in others from 1919, refer to returning soldiers, and to the war, but there really is no mention of just how bad an experience it had been. In the stories, there seems to be no “shell shock,” no poison gas, no death. I guess it would have been worth it had one of the names for WWI been true – “The War to End All Wars.” But unfortunately, they were wrong in 1919.